The Rome Italy Temple of The Church of Jesus Christ of Latter-day Saints has received extensive international and local coverage. Members of the Church of Jesus Christ and other Christians consider Rome to be one of the most historic locations in the world, a city where the ancient apostles Peter and Paul preached the gospel of Jesus Christ. The newest European temple in the historic Rome, a place of importance for Christianity, has caught worldwide attention. Rome Italy Temple© 2019 by Intellectual Reserve, Inc. All rights reserved. National Geographic Italy featured a photo essay of the temple grounds and open house press conference. The Rome Temple visitors’ center is highlighted with multiple pictures of the life-size statue of the Christus accompanied by the original Twelve Apostles. “A building fit for the King of Kings,” said Reuters about the temple. “With oil paintings of biblical scenes, Impressionist-style works depicting the Italian countryside and chandeliers of crystal gold.” Members of the Church built temples with the finest material in tribute to the Lord. According to Katholisch.de, members of the Church value the family. They believe that families can be together, even after death, the website of the Catholic Church in Germany explains in a detailed article about the open house at the Rome Temple. In a headline, the Protestant page Evangelisch.de describes the “Shiny Temple in the Suburb”. In the temple, members of the Church feel closer to their Father in Heaven than anywhere else, concludes the German Daily Frankfurter Allgemeine Zeitung in an article about the Rome Temple. To members, the temple is a symbol of eternity and points to Jesus Christ, as stated in a Deutschlandfunk story. Austrian broadcaster ORF reports at length about the open house, both on television and on the radio. They quote Raimondo Castellani, spokesperson for the Church, in saying that what occurs in the temple is sacred to those who believe. The new temple has given Latter-day Saints opportunities to build relationships with other faith groups and promote religious freedom. CNN International made headlines with, “Move over, Vatican – there’s a new church in town!” While the two churches have differences in doctrine, they worked together on numerous occasions to promote family values and to care for the poor. "We are friends with the Catholic Church," says Elder Ronald A. Rasband of the Quorum of the Twelve Apostles. "I have been part of an official delegation to go to the Vatican and meet with cardinals and others about not only this project and not only our church in Italy but relative to the interrelationship we have with our friends, the Catholics, all over the world, whether it has to do with humanitarian work, refugee work or freedom of religion in the public square." Swiss newspaper Cath.ch says that although Church members are few in Italy, “[Latter-day Saints] are involved in various environmental and social projects.” Acceptance and nurtured relationships with different opinion, civic, community and religious leaders are crucial to have religious respect and tolerance for everyone. Latter-day Saint temples differ from church buildings where members meet for Sunday worship services. 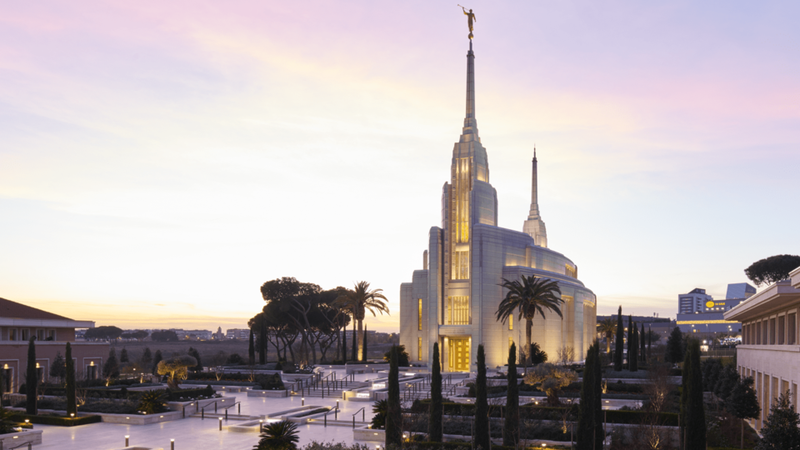 Temples are considered “houses of the Lord” where the teachings of Jesus Christ are reaffirmed through marriage, baptism and other ceremonies that unite families for eternity. Members of The Church of Jesus Christ of Latter-day Saints study the Bible and The Book of Mormon, another testament of Jesus Christ.